Nine of the Avalanche’s last 10 games have been on the road. Colorado has gone 4-5-1 in the three-week stretch. The injured Nathan MacKinnon, who skated with the Avalanche at practice in a red/orange non-contact jersey Tuesday at Family Sports Center, will be out of the lineup for the seventh consecutive game Wednesday night against Montreal at the Pepsi Center. He suffered the upper body injury at Vancouver on January 30, and if the most optimistic scenario in the wake of the 2-to-4 week prognosis had played out, he would have returned against the Canadiens. Without him suiting up, the Avs are 3-3-0. That’s mediocrity, but thanks to the widening of the safety net that came with a 10-game winning streak from December 29 to January 22, this recent stretch at least has been good enough to keep them realistically in the hunt for the second Western Conference wild card playoff spot. Yes, it could have been worse. 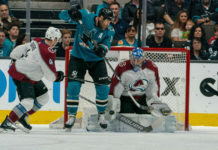 As the Avs finished up practice Tuesday afternoon, Colorado (64 points) was only two points behind Minnesota (66), currently in that last wild card spot, and one behind Los Angeles and Anaheim (65). By Tuesday night, though, Minnesota’s 3-2 win over the New York Rangers had put the Wild four up on the Avalanche. The Wild doesn’t play Wednesday, so a win over the Canadiens would get the Avalanche back within two. The Avs would also leapfrog the idle Kings and Ducks and be back in the ninth spot in the West. This all is against the backdrop of the Avalanche already considerably surpassing its 48-point total in a dreadful 2016-17. 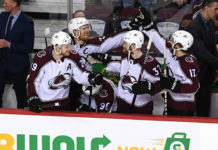 “If somebody would have told us last year that we’d be two points out (of a playoff spot) in mid-February, I’m sure we’d take that,” Landeskog said. In the six games with MacKinnon out, his replacement on the top line — Alexander Kerfoot — has one goal and no assists while mostly centering Landeskog and Mikko Rantanen, who also missed one game during the stretch with a lower body injury. 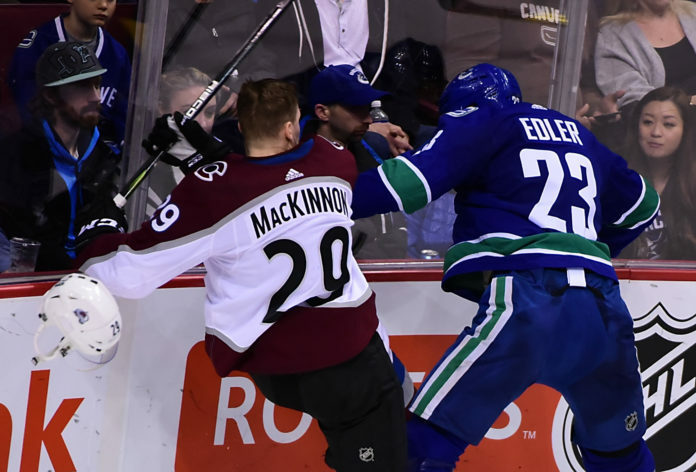 MacKinnon wasn’t made available to the media Tuesday after practice, but coach Jared Bednar quickly confirmed to those on hand that MacKinnon wouldn’t play against the Canadiens. Under prodding, Bednar then expanded on that answer. Will he play against Montreal? Will he play later in the week? “I don’t know that,” he said. Who’s going to start at quarterback for the Broncos next season? MacKinnon also skated with a handful of Avs on the second rink before practice and did additional work on his own after practice. While he won’t play against the Canadiens, he does seem close, and the Avalanche plays at Winnipeg Friday in a standalone road game before returning to face Edmonton at home Sunday afternoon. If this were on the board in Las Vegas, the favorite in the wagering would be that he returns against the Oilers. But I don’t know that, either. Bednar did disclose that Semyon Varlamov would get the start in net against the Canadiens, and he also talked a bit about the status of former Canadiens Mark Barberio and Sven Andrighetto, both out with lower body injuries. Andrighetto hasn’t played since December 31 against the Islanders, and Barberio’s last game was at Montreal on January 23. “I think taking into consideration some of our injuries that have piled up here lately …,” Bednar said. “We’re 3-3-1 with Mac out (including the overtime loss at Vancouver on the night MacKinnon was injured), I’d say that’s pretty good. The problem is, it’s not good enough. We’re losing ground every day in the playoff race. When (MacKinnon) went out, we were in the last wild card spot and now we’re chasing that. “So it takes more than .500 hockey to stay in this race right now, especially in our division, which is unfortunate, but that’s the facts. So we’re going to have to find a way to win a few more games without these guys. . . If we’re just looking to survive, then we’re not going to keep pace. Within our room, we feel like we have enough to win and guys need to step up. Beginning February 26 against Vancouver, the Avalanche plays 12 of its final 21 at home. The goals have to be lofty, but the reality is that if the Avs still are within two points of the final playoff spot when that stretch begins — or better than that, of course — they’ve given themselves a chance. Denver-based journalist Terry Frei writes two commentaries a week about the Avalanche for Mile High Sports. He has been named a state’s sports writer of the year seven times, four times in Colorado (including for 2016) and three times in Oregon. He’s the author of seven books, including the fact-based novel “Olympic Affair” about Colorado’s Glenn Morris, the 1936 Olympic decathlon champion; and “Third Down and a War to Go,” about the 1942 football national champion Wisconsin Badgers and the players’ subsequent World War II heroism. His web site is terryfrei.com and his additional “On the Colorado Scene” commentaries on subjects beyond the Avalanche are at terryfrei/oncolorado. Why Can’t MacKinnon do that every night? And this Avalanche team is? Is Zadorov ready to be – and stay – a top-pairing “D”? This isn’t just Jared Bednar’s second season. It’s his second chance.